So last Tuesday I was sitting here watching with horror footage of violent rioters 'destroying' my beloved city of Manchester. Watching the shops where I had taken my children shopping only a week previously be smashed up and looted really broke my heart. This was our City, a place of culture and investment in the future, a place I was proud to bring my children up in. It also upset me to see the shopping centre in Salford where I worked when I first moved to Manchester almost seven years be pulled apart by thugs. It frightened me that not only was this happening so close to where my family where sleeping but also that these men and women lived among us. The men and women who were smashing windows and lighting fires or evening just taking the opportunity to steal from the targeted businesses weren't only those who we would normally see as 'criminals', these were people we would walk past in the street or stand next to on the bus stop. The fact that there were so many people involved really scared me and made me worry about the society I was bringing my children up in. Then on Wednesday morning the 'real' people of Manchester came together to clean up our city and make it something to be proud of again. Pictures of people of all ages working together with brushes and brooms flooded the social networks and we saw what Manchester was really made of! Our police forces used all means possible to target the criminals responsible, Arrests were made, warnings were given, rain came down and the senseless destruction ceased. Tonight, one week and a day after that night of violence I had cause to be in the city centre for the first time since the events. I was really dreading it. After seeing the images of businesses being ripped apart on the news I was sure I was going to see a damaged City. Instead I saw Manchester, bright and shiny and still in Business! Yes, I did walk past the burnt out shell of Miss Selfridge and there were a few shops such as Vodaphone and TK Maxx with boarded windows but I was pleasantly surprised to see that most of the affected shops were showing no signs of that night. New Cathedral Street that I had seen smashed up on the news was all fully glazed and restocked, Mark & Spencer’s was being re-glazed even as I walked past. This was still a city centre I could take my children to, we could go shopping, visit MOSI, have a meal and feel safe. The one thing I did notice was the I Love MCR Posters everywhere! In every shop window I passed, on walls and even on t-shirts people wore. Out of one night this city is ashamed of we now have a campaign we are proud of! The fantastic 'WALL OF LOVE' in the Arndale centre started by 23 year old Adam Brookes who used to work in the Arndale, and now covered in thousands of post-it notes of support in multiple languages shows how much pride we have in this City. The ‘I LOVE MCR’ Campaign wants to make 26th August a day where the message is spread! Check out their facebook page for more information and to download posters or twibbons. 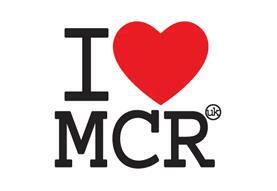 I can honestly say I LOVE MANCHESTER... DO YOU? ?